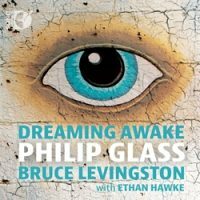 “Dreaming Awake.” Philip GLASS: Études Nos. 1, 2, 5, 6, 9, 10, 11, 12, 16, 17 (1994-95; 2012); The Illusionist Suite (2006; arr. Bruce LEVINGSTON); Wichita Vortex Sutra* (1988); Dreaming Awake (2003); Metamorphosis No. 2 (1988). Bruce Levingston (pno), Ethan Hawke* (speaker). Sono Luminus DSL-92205 (2 CDs) (http://www.sonoluminus.com/). 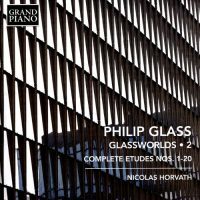 “Glassworlds 2.” Philip GLASS: Complete Études Nos. 1-20 (1991-2012). Nicolas Horvath (pno). Grand Piano GP690 (1 CD) (http://www.naxos.com/). Folks expecting a metronome or brash chords will be surprised with Levingston’s limpid Glass recital. Several Études are folded around other pieces, including a suite taken from the movie The Illusionist. Ethan Hawke’s soothing, faintly hoarse voice reads Allen Ginsberg’s poem Wichita Vortex Sutra. The title piece, Dreaming Awake, is a study in texture and style, perhaps a quick inventory of techniques deployed throughout the Études. Levingston’s comfortable two-disc traversal (53:02 + 56:30) concludes with Metamorphosis No. 2, unexpectedly dispiriting. The material was used memorably in Glass’ score for Errol Morris’ The Thin Blue Line. Horvath is brazenly impetuous (I: 4; II: 14, 17). If Glass’ own versions are, well, glassy, then Horvath is coarse like an off-road vehicle finding its way on the beach. Consequently, Horvath discovers a universe of expressive possibilities, especially in the more serene etudes (I: 3, 5) and in the last of the second book (II: 19, 20) which emerge as passionate novellas. Hearing the whole 20-piece sequence (38:37 + 44:48) elucidates Glass’ development and instructs how the Études can be a vehicle for Romanticism. Robert CASADESUS: Sonata No. 3, Op. 44 (1948); Toccata, Op. 40 (1946). Henri DUTILLEUX: Blackbird (1950); Au gré des ondes (1946); Sonate (1947-48). Cicilia Yudha (pno). Navona Records NV6053 (1 CD) (http://www.navonarecords.com/). These works were written between 1945 and ’51, demonstrating an interesting slice of somewhat conservative French piano writing, but polished classical construction. (Boulez’s 1952 Structures I was around the corner, sparked by Messiaen’s Mode de valeurs et d’intensités from the 1949-50 Quatre études de rythme.) Casadesus’ Third presents three movements in a fast-slow-fast design, 15 minutes of understated sophistication. The Toccata is slightly more elegant. 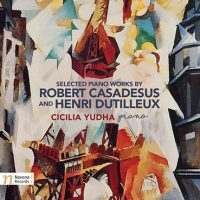 Dutilleux wrote only one Sonate, more complex, sensual and impulsive compared to Casadesus’. We sense that many pages were discarded on the way to this masterpiece, perhaps the six witty but not as confident pieces that comprise Au gré des ondes. 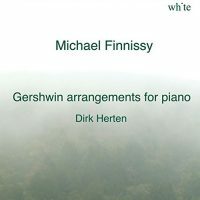 Michael FINNISSY: Gershwin Arrangements (1975-88). Dirk Herten (pno). White Records [no number] (http://www.white-records.com/). We must trust Finnissy’s sensibility as he adoringly alters the familiar, introducing distortion and curious dissonance with bountiful wrong-note accompaniments. Herten is determinedly relaxed across these 13 Gershwin tunes, proceeding leisurely, comfortably in those passages which resemble jazz or lounge ramblings. These are not easy assemblages. 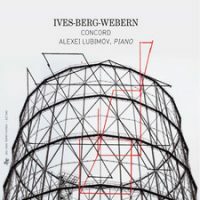 “Ives-Berg-Webern: Concord.” Charles IVES: Piano Sonata No. 2, “Concord, Mass., 1840-60” (1915-19). Anton WEBERN: Variations for Piano, Op. 27 (1935-36). Alban BERG: Sonata, Op. 1 (1908-09). Alexei Lubimov (pno), Marianne Henkel (fl). Zig-Zag Territoires ZZT362 (1 CD) (http://www.outhere-music.com/). This is a great program, but observe that on this 2015 release, the Ives was recorded in 1997 and the Webern and Berg in 1999. Did Lubimov ever play these consummate works together? I want to enjoy the Ives but find the opening Emerson too hurried and aggressive. Hawthorne is an appropriately hectic party, The Alcotts are soothing, and Thoreau evokes grand mystery (here with obbligato flute). Lubimov drives at a fast clip. Ives’ rambling is closer in temperament to Berg’s sensuality, but the proximity to Webern exposes similar lightning, especially in Op. 27’s central, canonic Sehr schnell. 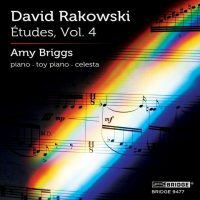 “David Rakowski: Études, Vol. 4.” David RAKOWSKI: Études Nos. 77, 86, 80, 71, 73, 72, 81, 74, 85, 87, 75, 82, 89, 76, 97, 93, 87, 84, 88, 78, 83, 90 and 79 (2006-10). Amy Briggs (pno). Bridge 9477 (1 CD) (http://www.bridgerecords.com/). Rakowski has written 100 piano Études in varied styles. The set is complete, although I wouldn’t be surprised if he produces more. They are through-composed works, each written in a set number of days (no more than six) and each seems to concentrate upon a particular compositional problem. Punning titles (No. 86: “Prog Springs Eternal,” No. 82: “F This”) suggest their hidden references and quotes. This 23-piece collection is the fourth that Briggs has gathered for Bridge. There will be at least one more to round out the century. Several in this batch require multiple keyboards: No. 71, “Chase,” alternates between piano and celeste, requiring precise rhythmic execution as unison lines drift. One standout is No. 74, “Not,” for speaking pianist, working through a short poem whose words gradually drip into place, like someone angrily disciplining a pet. “Ten.” Frédéric CHOPIN: Études, Op. 10 (1829-32). Leopold GODOWSKY: Studies on Chopin’s Études, Op. 10 (1894-1914). David Stanhope (pno). Tall Poppies TP230 (2 CDs) (http://www.tallpoppies.net/). Stanhope modestly calls himself a trombonist, yet here he is taking up a corner of the most difficult piano repertoire. Godowsky famously extended Chopin’s already difficult technical and expressive Études by compounding them with filigree, or requiring that they be played with one hand, or combining them. 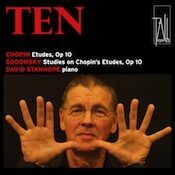 By interleaving Godowsky’s supersized etudes with their originals, Chopin emerges quaint, linear and simple. The astonishing left-hand Études definitely overwhelm Chopin’s originals. Marc-André Hamelin is the one to beat in this repertoire (Hyperion CDA67411/2, 2 CDs, containing all of Godowsky’s Studies on Chopin’s Études). Stanhope is all business, often faster than the smoother Hamelin, who might slow to emphasize momentarily strange progressions and spritely codas. As Stanhope interleaves the Chopin originals with Godowsky’s dissertations, we’re constantly encountering the familiar among the florid. It’s unusual to confront an environment where Chopin seems sedate. “Keeping Time.” Vivian FUNG: Keeping Time (2011). Jennifer HIGDON: Secret and Glass Gardens (2000). Katherine HOOVER: Dream Dances (2008). Jing Jing LUO: Mosquito (1991). Judith SHATIN: Chai Variations (1995). Stefania DE KENESSEY: Spontaneous D-Combustion (2012). Nancy Bloomer DEUSSEN: A Recollection (1995). 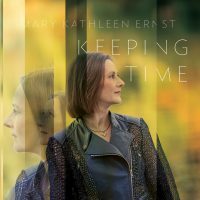 Mary Kathleen Ernst (pno). Innova 868 (1 CD) (http://www.innova.mu/). Ernst’s recital begins with Fung’s bright etude, Keeping Time, which circles around a constant pulse. Higdon’s Secret and Glass Gardens uses dreamy impressionistic chords with darkened edges, and a peak occurs near the golden section point. A sequence of dances is grouped in Hoover’s single-movement Dream Dances. Luo’s Mosquito bears resemblance to the particular pest, although with a welcome variety of digressions. The Chai Variations comprise 18 explorations on Eliahu HaNavi, in turn recalling Rzewski’s People United because of the treatment of the traditional Jewish tune. The last two entries are intentional tonal visitations. Spontaneous D-Combustion sets itself up as a perky fast-slow-fast Tin Pan Alley concerto. Recollections comes from a pair of pieces together titled Musings: Circa 1940. The aching tune reminds of an earlier, perhaps simpler time.